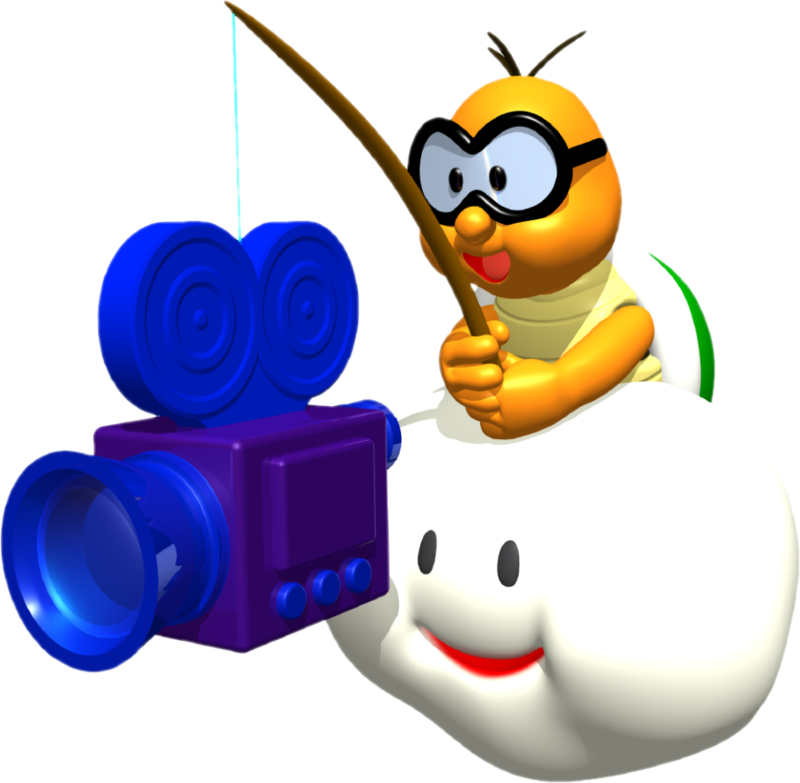 Lakitu Bros. are Fishin' Lakitu brothers that are found in Super Mario 64 and its remake. These characters have cameras hooked at the ends of their fishing poles instead of items. According to the Super Mario 64 Nintendo Player's Guide, they are employed by the Kingdom News Network. A Lakitu Bro. in Super Mario 64. At the start of the game, one of the Lakitu Bros. first appears in the sky after Princess Peach's message to Mario. It circles Peach's Castle, then approaches a nearby Warp Pipe, from which Mario emerges, starting the adventure. The hero attempts to head inside Peach's Castle but is stopped by another Lakitu, who introduces himself and his partner as the Lakitu Bros. One of the Lakitu Bros. mentions that they are cameramen reporters and will film Mario throughout his adventure as he attempts to retrieve the Power Stars and rescue the princess, castle servants, and the world. It is also mentioned that they will record Mario at a recommended angle, though this angle can be changed through the use of the C Buttons, pressing while stationary enables the player to enter first-person view, which can be negated by pressing , that camera modes can be toggled via the button, and that there are signs scattered in and around the castle that contain this information. Their explanation finished, one of the Lakitu Bros. leaves, and the other remains to record Mario's adventure. When Mario enters Whomp's Fortress for the first time, the Lakitu Bro. following him issues an update to Mario's adventure. From him, Mario learns that he can sneak up on sleeping enemies by moving slowly past them. The Lakitu Bro. then reiterates his instructions from earlier before leaving Mario to his task. The Lakitu Bro. stays with Mario for the remainder of his adventure and can be seen in the big mirror in the room that leads to Snowman's Land. 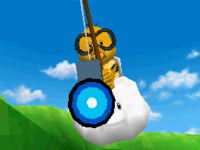 One of the Lakitu Bros. in Super Mario 64 DS. In Super Mario 64 DS, the opening is slightly different. Shortly after Mario, Luigi, and Wario go missing, Yoshi is seen sleeping on the castle grounds, and one of the Lakitu Bros. pops the bubble Yoshi is blowing out of his nose to wake him up and tells him the heroes have gone missing. After hearing the news, Yoshi tries to enter the castle, but the door is locked. As Yoshi turns around, the Lakitu Bro. reappears and tells him that a rabbit took the key, and that Yoshi should find it and gives him a map to use on his adventure. After catching the rabbit, Yoshi enters the castle. In this game, the camera is controlled by the and buttons on the Nintendo DS. A Lakitu Bro. in Super Smash Bros. The Lakitu Bro. made a cameo appearance in Super Smash Bros. He appears flying in the right direction of the background in Peach's Castle after a few minutes. Certain Lakitus also use cameras in Mario Golf and Mario Tennis for the Nintendo 64, Paper Mario: The Thousand-Year Door, and Mario & Luigi: Partners in Time, just like Lakitu Bros. Although their artwork shows it, Lakitu's Cloud has no given face in Super Mario 64. It is given one in the remake. This page was last edited on April 5, 2019, at 11:25.